Beetroot Biryani! I heard about it for the first time in Hyderabad itself. My colleague would bring in lunch. It’s tasty! I’m someone who would avoid eating beetroot raw. Even if it is served in salad, I would avoid taking it. I had always liked Chukandar ka halwa but Chukandar ki biryani or Beetroot Biryani was new to me. Beetroot, also known as Chukandar in Hindi, has many health benefits. It helps in lowering blood pressure, detoxifies body, improves immunity, prohibits inflammation; it’s good for skin and bones too. It is high in Vitamin A and C. If you go to market and buy this vegetable, try to get the ones with greeny leaves. Beetroot’s green leaves are edible too. Include it in your diet plan. May be in form of Biryani. Tasty and good for your health too. 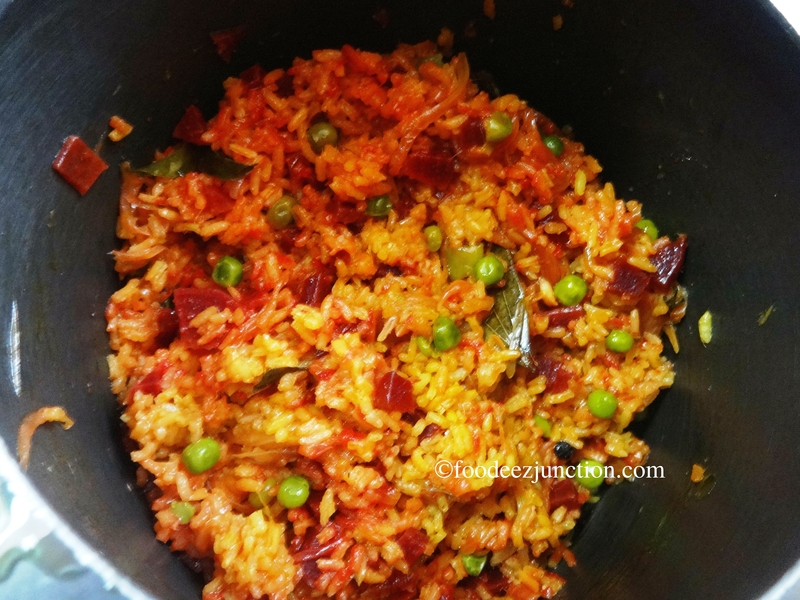 I had made beetroot biryani several times at home and everyone liked it. Hope you like it too. Beetroot Biryani Recipe’s main ingredients are rice, beetroots and some of the spices. It’s easy to make. If you have everything chopped and cut, the Time Taken to make Veg Beetroot Biryani through this recipe is 25 minutes, maximum. I had boiled the rice first to make the Veg Beetroot Biryani. Take a pan, pour water in it. Add the soaked rice. Put the pan on high flame. Let the rice boil for 3-4 minutes. Switch off the gas stove. Strain the rice and keep it aside. In a pressure cooker, heat oil. Add tejpatta, cumin seeds, kali mirch, Curry leaves, chakri phool, cloves and dalchini. Saute for 20 seconds. Add sliced onions and fry till it turns golden. Now add ginger-garlic paste and saute for 30 seconds. Add haldi powder, green chillies and saute for 30 seconds more. 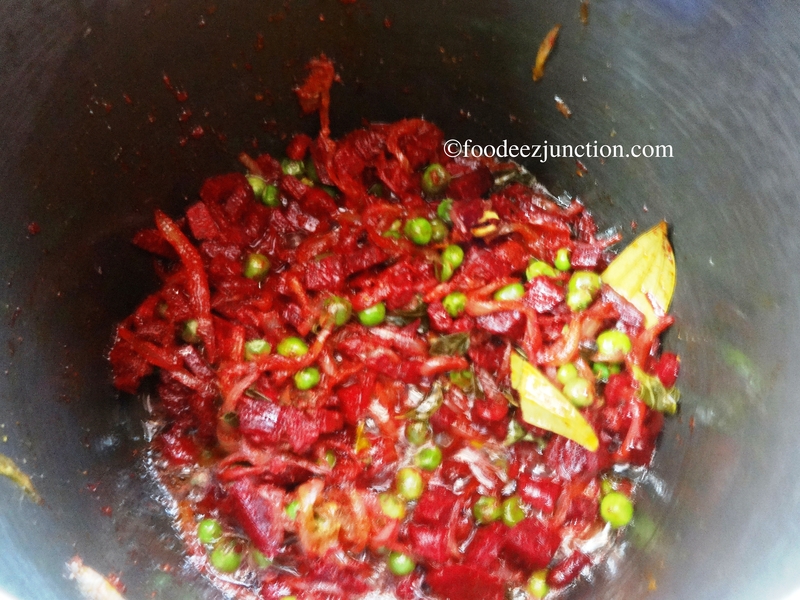 Now add beetroot and peas, saunf, salt and garam masala. Lower the flame. Stir fry. Let the fat separate from the beetroot masala. It will take 5-7 minutes on low flame. Add rice and lemon juice to the beetroot masala and mix well. Pour 3 cups of water. The water level should be just equal to the rice and masala level. 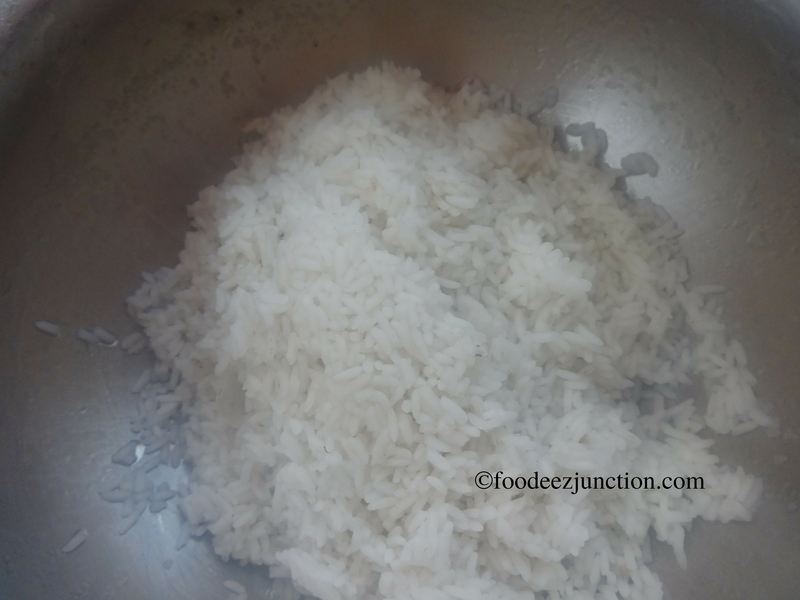 If you are not using boiled rice then use 5 cups of water for 2 and half cups of rice. Sprinkle mint leaves and chopped coriander leaves and close the lid of the pressure cooker. Leave it for 2-3 whistles. After 10 minutes open the lid of the pressure cooker and carefully stir the biryani, without breaking the rice pieces. Veg Beetroot Biryani is ready to be served. Have it hot with any achar or Dahi ka raita in Lunch. Tip: Try not to store the Beetroot Biryani for 6-7 hours. It would change to reddish colour and won’t look fresh.